Dogs are so much a part of our families that we share just about everything, including our body care products. 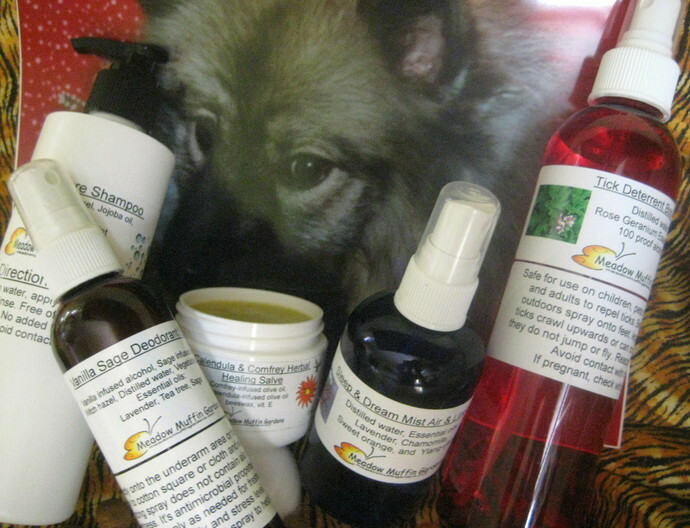 This assortment of practical, handmade body care products are safe for people and their dogs. Should you be looking for a gift for an animal lover who believes in all-natural safe pet care products, look no further. Free from synthetic preservatives, fragrances, the ingredients used come from organic, reputable suppliers or from my own herb garden. Just as with people, what we put onto our bodies is absorbed into our bodies. Dogs are no different. Trust handmade, safe alternatives for their care. A pleasant shampoo for your dog's bath time this 8 oz. 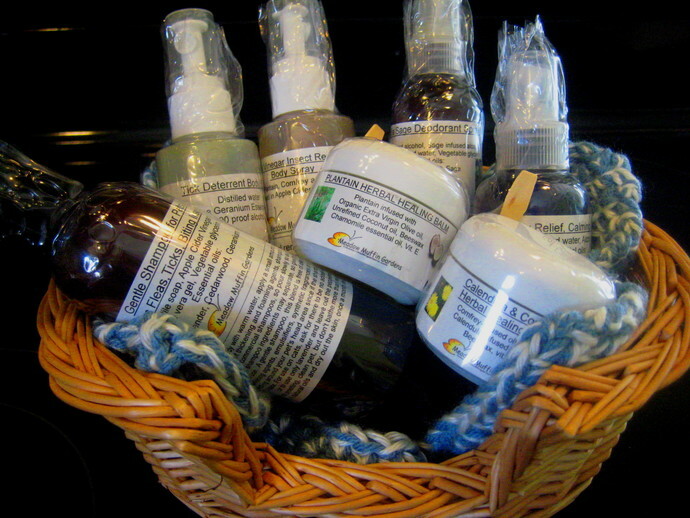 bottle of shampoo consists of castile soap, aloe vera gel, jojoba oil and various essential oils. There is a choice between a flea deterrent blend, irritated skin blend or a general wash blend. Let me know which you prefer or I'll choose for you. Free from emulsifiers (you'll have to shake before each use), synthetic preservatives (best if used within 6 months), thickeners (the consistency will not be as thick as is typical with shampoos but being concentrated lathers very well) and artificial fragrances. Not for use on cats. A cat's liver does not contain the necessary enzymes necessary to break down certain essential oils and over time may become toxic for them. This deodorant spray can come in very handy for your problems with doggy odor, such as that wet dog smell on a rainy day or after a bath. Just spray onto your dog and fluff the fur to help combat pet odor. Sage is an herb with strong astringent and cleansing properties. Its sharp, clean smell is often found in pet odor eliminator candles. It's antimicrobial properties make it very useful for not just covering up odor, but destroying the bacteria causing the odor. This spray comes in a 4 oz. bottle with a spray top. Minor wounds or rashes can easily be treated at home. Known as a wound herb, calendula is a wonderful ally in treating your pet, your child or yourself for not only wounds but to help clear up frustrating skin irritation and rashes . The challenge with using any salve on an animal is keeping it there long enough to do its job before being licked clean. This herbal balm contains nothing that would harm your pet if ingested. Comfrey has the reputation of being a living medicine chest. A member of the Borage family, this herb was known as the plant that can join back together what has come apart, be it broken bones or tissue repair. If using on deeper wounds apply on the second or third day of healing. The allantoin in comfrey may cause the skin to close too quickly, causing the outer skin to heal before the inner wound is ready. Wounds need to heal from the inside out. Wash and disinfect the wounded area before applying a salve. This salve is safe for use on cats. This salve/balm comes in a 1 oz. jar. Plantain and Chamomile are wonderful aids to help with skin issues. Containing healing and anti-inflammatory properties, conditions involving dry skin, itchy patches, hot spots and allergies can be relieved with the help of an herbal balm. Coconut oil is known for not only its anti-fungal, anti-inflammatory properties, but is very useful to help keep the skin hydrated and control flaky dry skin. Coconut oil is wonderful for maintaining a beautiful sheen to your dogs fur. Safe for cats as well. This balm comes in a 1 oz jar. The Anxiety Calming Spray consists of a combination of essential oils therapeutically known for their value in relaxing nervous excitability and emotional conflict. Lavender, chamomile, sweet orange, and ylang ylang are an excellent combination for anxiety, trouble sleeping, settling down overstimulated children, and calming the fears in your dogs from such things as thunderstorms, fireworks, gunshots, and even separation anxiety. Spray the linens of your sleeping area or pet bedding but do so sparingly in case you find the aromatics too strong. Dogs' sense of smell is very acute so if a dog doesn't seem to like this spray it can be diluted with distilled water. If you want it already diluted for this assortment it will come in an 8 oz. bottle. Just let me know upon ordering. For use on human bed linens, spraying your pillow directly is optional, as there is always the risk of skin sensitivity. This anxiety spray can be used sparingly for cat bedding if diluted. Don't spray directly on your cat. This spray comes in a 4 oz bottle with a spray top. Plantain, Yarrow and Comfrey combine with apple cider vinegar to become a pet and child safe, DEET free bug repellent. Apple cider vinegar can be used as a safe alternative to help repel fleas. Fleas don't like the way vinegar tastes and smells. As some of the chemicals used for topical flea treatments can be just as dangerous as the pests themselves, knowing other ways to keep them off your pets are always good to know. Being dog's have such a sensitive sense of smell and the vinegar alone may dry out the skin, the vinegar will be diluted with distilled water and come in an 8 oz. spray bottle. Avoid getting the spray into your pet's eyes. An herbal vinegar without the addition of essential oils, this flea deterrent is safe for both cats and dogs. The presence of ticks and the fear of Lyme disease should not deter you or your dog from enjoying the outdoors. You just have to take necessary precautions and be on the lookout for the pests by checking yourself, your clothes, and your pet. It is said that should a tick be a carrier of Lyme it takes about 24 hours before the Borrelia burgdorferi bacteria can be passed on once the tick latches on, so diligence in precautions does pay off. Ticks can be very stubborn to the typical flea and tick sprays. Rather than dousing yourself and loved ones with pesticides and organophosphates, and then worry about the risks of these toxic ingredients, try an approach these buggers naturally detest and don't build up a resistance. The scent of certain essential oils encourages them to flee. Ticks don't like the smell of the oil therefore try to avoid it. This 8 oz. bottle of spray consists of distilled water, a bit of alcohol and Rose Geranium, Pelargonium graveolens, a necessary part of any effective eco-friendly tick deterrent. Before heading outdoors spray yourself, especially shoes and pants as well as your dog. For use on cats, be sure to dilute with additional distilled water. Upon request I can put it into a 16 oz. bottle with the additional water. 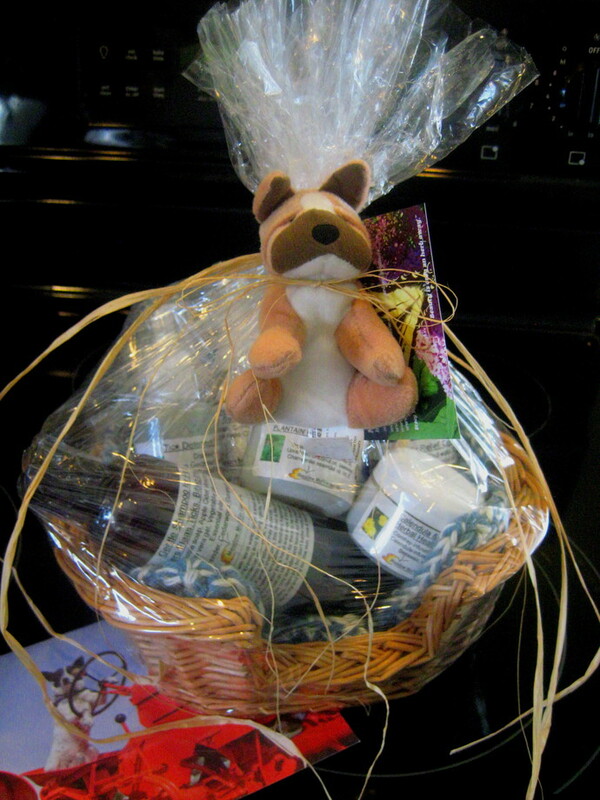 These items will be lovingly arranged in a cellophane wrapped basket all ready for gift giving. Basket will differ.